On completing the Cerise Jacket (http://carouselcottagecrafts.com/wedding-guest-outfit-1st-garment/) I still had approximately 1/3 yard of fabric left over. What to make? 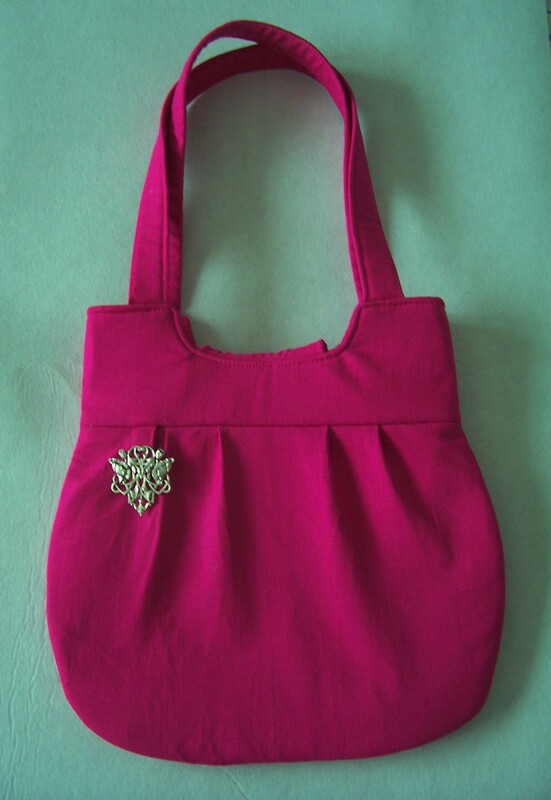 I know, I will re-visit a favourite bag pattern – Simplicity 2396. 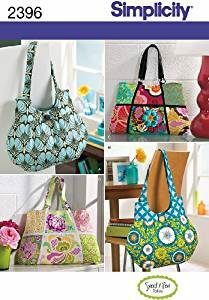 After a search of my pattern stash I located the pattern and also a copy of the workbook that I had prepared when teaching a class for making up this bag. Result! I cut out the Cerise fabric and having checked my remnant stash decided to use some bold-patterned stretch cotton sateen that was purchased during a visit to Norfolk. The original dress has long-since been sold (shame as I really liked the fabric) but there was still sufficient to line this bag and maybe make another. I had some remnant ‘headliner’ wadding (replacement for Bosal ® or Soft & Stable by Annie ®) and decided to ‘trial’ this in the new bag. I used the headliner inside the straps, fastening tab, bag top bands and also the main sections. 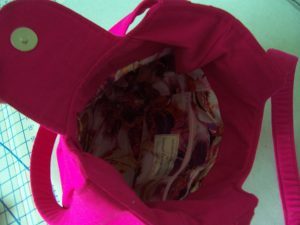 Conclusion – the wadding is fine, easy to cut and stitch but is more appropriate for a structured bag not a ‘soft’ bag. 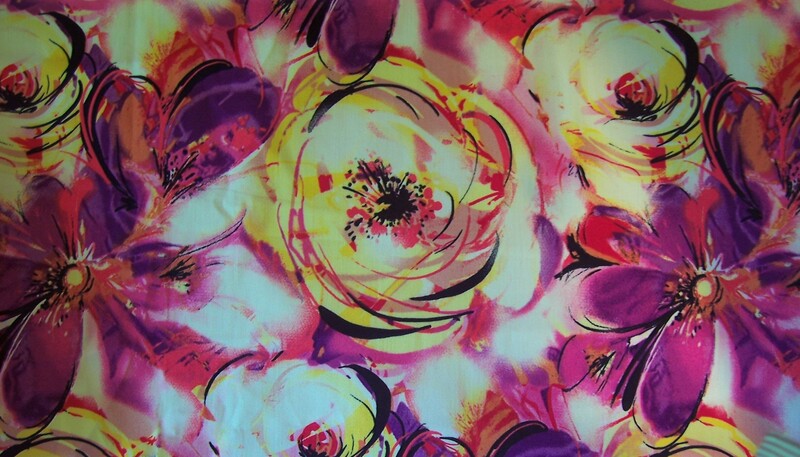 As both the Cerise linen and the cotton sateen lining were fairly ‘robust’ I did not use fusible interfacing. Construction was straightforward although I did reduce the size of the main body of the bag so that it fit the headliner fabric that I had cut from remnant. I added a loop to hang between the top band and the body. This can be used for attaching a bag charm or tassel, for now I have added an Art Nouveau-style brooch. The fastening tab which conceals a magnetic snap is my usual addition together with several pockets incorporated into the lining. This bag sports a zip pocket with two slip pockets behind plus a divided pocket just the right size for a mobile phone. Finished size is approximately 13 inches deep excluding the straps which are just long enough to go over a shoulder, by 12 inches across. 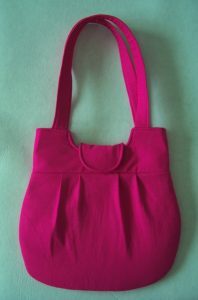 The bag will coordinate well with my outfits and as I frequently wear shades of Pink I think it will have many outings over the coming Summer months.